The area underneath my eyes had been bothering me for a while as with the march of time, it was starting to look a bit hollow. I had done some research and knew that injecting fillers in the tear troughs could improve the look of the area, but for me, putting a syringe close to my eyes was a scary proposition! Still, I had seen good results with fillers on a friend or two and was considering the option. Then, I looked into laser treatments and in the process learned that they could also brighten the under-eye area in more ways than one. While I was contemplating the idea of fillers, I went to see Dr. Roy Geronemus to eliminate some broken capillaries on my cheeks. He pointed out the visible blue veins underneath my eyes and said that he could remove those with a laser too. Ditto for the larger veins around my temples. I had noticed those blood vessels but they never bothered me much as I thought they were pretty common. Well, of course, after they were brought to my attention, that’s all I could see when I looked into the mirror. But still, I held off. Would removing these veins affect the blood flow to the eyes? Even though Dr. Geronemus and two other dermatologists assured me it would have no detrimental effect on circulation, it took me a few months to screw up the courage to submit to a laser. A pair of metal ocular shields were placed directly on my eyeballs to shield them from the Excel V laser. This was not something I expected and after they were plucked off at the end of the procedure, my eyes felt raw and sensitive. If you wear contact lenses, I highly recommend that you leave them at home and just wear your glasses for this treatment. As for pain, underneath my eyes, there was just a stinging sensation at the point of contact with the laser. The elimination of the larger veins on my temples was more painful however. No topical anesthetic was applied as this constricts the vessels, making it more difficult to treat. All in all, the procedure lasted a brief 10 to 15 minutes. Costs range between $450 – $750 depending on the extent of the treatment. Afterwards, the under-eye area was a bit red and swollen for a couple of days, as expected. A small scab had formed which worried me somewhat as Dr. Geronemus cautioned that there is a very small risk of scarring. But, this too went away without a trace in a few days, helped by the application of Aquaphor. The blue veins had disappeared almost immediately and I was pleased with the fast results. A follow up visit may be necessary depending on the number and size of veins. In my case, a couple of visible blood vessels remained so a month later, I returned for a second visit. An unexpected and very pleasing side effect was that, by the time of my second treatment, the skin underneath my eyes looked smoother, thicker and thus lighter. Dr. Geronemus confirmed that this is not an uncommon side effect because when thermal energy is delivered into the dermis, as it is with lasers, you get neocollagenesis or the formation of new collagen. Should new veins pop up underneath my eyes, I will certainly have them treated with a laser if only for the collagen-boosting results! I had decided to take the plunge, pleased as I was with the results of the laser treatment. The fillers typically used in the under-eye area are hyaluronic acids such as Restylane, Juvederm and Belotero. Made of a natural sugar that’s in your skin, hyaluronic acids give a soft correction to facial hollows. Effects last approximately six months after the first treatment, but can last even longer after subsequent treatments. I opted for Belotero as the skin under the eyes is thin and Belotero is the thinnest of the hyaluronic fillers. Costs range between $700 – $850 depending on the product used. The hollow grooves located on top of the orbital bone are referred to as the tear troughs because tears roll down this track. Although there are no dermal fillers that are FDA-approved for the tear trough, fillers are used off-label in this area. Too much filler results in lumpiness. And if the filler blocks a retinal artery, it can cause blindness. Dr. David Orentreich is the experienced dermatologist I turned to for this procedure. After the area was numbed with a topical analgesic cream containing Lidocaine, he injected a small amount of Belotero in the tear trough, patting it down as he went along. I had a bit of swelling and redness (but no bruising) afterwards which lasted for a day or two. A week later, Dr. Orentreich manually smoothed out some residual unevenness. Injecting the under-eye area with filler has not only reduced the hollowness, but it has also plumped up some of the wrinkles, reducing the existing crepiness. Lavido Alert Eye Cream is an all-natural under-eye cream from Israel that combines plant-based hyaluronic acid, cold pressed avocado oil, organic pomegranate seed oil and citrus extracts with the volcanic thermal springs from the sea of Galilee to brighten and moisturize the skin around the eye area. Clinically proven to increase skin’s elasticity and help diminish the appearance of fine lines and wrinkles. 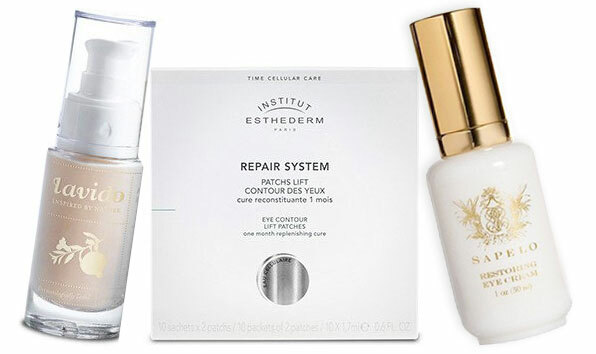 If you need a real jolt, try Institut Esthederm Lift & Repair Eye Contour Lift Patches. These five-minute wonders contain caffeine and tighten and lift the skin under the eye area as well as smooth fine lines and wrinkles. This is Travel Beauty’s founder, Alyssa Weiss’, favorite eye product. She says your face will immediately brighten up and look younger. She loves the patches for travel, before important meetings and prior to attending gala events. To be used 3 x per week. The light formula of Sapelo Restoring Eye Cream absorbs right into the skin, boosting collagen production with a blend of powerful peptides, reducing dark circles with botanical burdock and strengthening capillaries with a cocktail of antioxidants. By: Delia von Neuschatz for New York Social Diary. Getting married this spring or summer? Believe it or not, NOW is the time to start thinking about your skin. This will likely be the most photographed and filmed day of your life, with lots of close-ups. If you’re wondering how to get that effortless, fresh-scrubbed look that will carry you through your honeymoon, I’m about to tell you: It takes effort! Since you’re working up to your wedding day, and you may have photo shoots or events leading up to the big day, in my opinion, it’s best to have a series of less aggressive treatments that require little or no downtime rather than harsh ones (like deep chemical or deep laser peels) that require significant healing time, and may cause pigment irregularities, or excessive dryness or redness during the healing period. The cost is comparable, and this type of “stacked” plan is less risky, allowing you to achieve the same, or superior results, gradually by stacking the right treatments at the appropriate intervals. Target the imperfections beneath the skin: banish brown spots and shrink capillaries with medical IPL (intense pulsed light) treatments that use special filters to erase imperfections below the surface of the skin. Adding a SkinTyte treatment at the end of each session is helpful for those prone to acne, and for shrinking pores. These sessions should be spaced about a month apart. Replace dry, damaged skin cells at the skin surface: Encourage cell turnover on the surface of the skin, and allow your face to make brand new, perfect, skin on its surface with a series of treatments (options include superficial laser peels, topical ViPeel treatments, or MyBody Probiotic Youthboost treatments, depending upon your skin and your particular concerns). We can discuss which of these treatments is right for you, your schedule, and your skin, during consultation. These sessions should also be about a month apart, and staggered with the IPL treatments. Maximize and maintain your results: Perfect skin care and eye care products between treatments are essential. Starting 3-6 months before your wedding means that you have some time to get the absolutely best product regimen in place for your skin, so that you will have predictably gorgeous skin from now until go time. And sunscreen is a MUST. ALWAYS. On a side note, if you’re thinking about Botox or facial fillers, like Juvederm, Juvederm Voluma, or Belotero, before your big day, definitely do not wait until the last minute. I recommend these treatments between 4 and 5 weeks before the wedding. To schedule an appointment with Dr. Liotta, please visit: www.FacialPlasticsNYC.com or call 212-288-2222.